In this chapter we will focus on ships which had a significant impact on Naval History, chiefly on propulsion innovations, but not only: Navigation, cargo handling, protection, or just ships associated with particular events or campaigns (like oceanography). A Bulk carrier (“bulk carrier”) in English, is the goods carrier “by default” since probably the Middle Ages. During the antiquity, it already existed but standardized to the transport of ponderous thanks to the amphorae, the world’s first “universal container”. The transportation of all types of goods was the norm before the appearance of container ships. Bulkers in the modern sense of the term appeared around 1860, the pioneer being the John Bowes (1952). Prior to this date, because of the sailing, the crossings were long, and for steam still stammering and mixed transport, the coal took too much room to make profitable the remaining place in the hold. The transport of heavy goods in large holds did not go without serious stability problems, which explained many shipwrecks. The loading of various goods was a real headache and a very long operation, and dangerous for the dockers as for the sailors. Without solving these loading problems, the John Bowes was for the first time bringing a set of solutions to these problems and generate a real specialization. Until 1914, this type of cargo steamer alone was predominant, facing a traffic still largely populated by tall iron sailing ships. 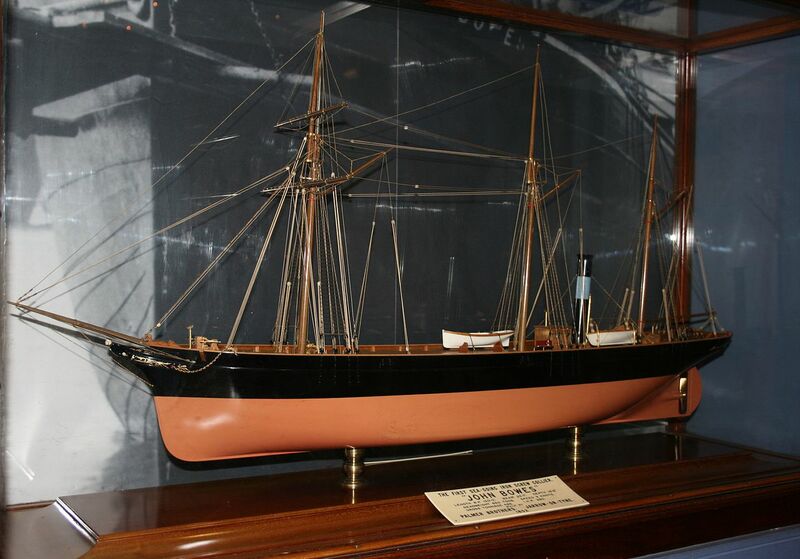 In 1905 alone, about fifty of these steel sailing ships were launched. Sailing seemed to many shipowners, still profitable in some segments of the shipping industry. Progress will be slow and will be on the shape and the opening and closing devices of the holds, the mechanisms of the hoists and all the maneuvers on board. If the steam managed them, the electric would slowly take its place. The use of hoists of a new kind made it easier to load. 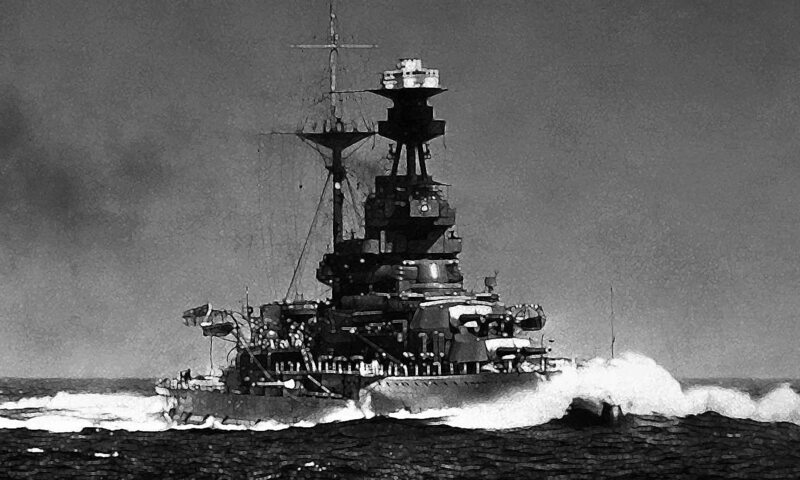 In 1914-18, maritime traffic, which for the most part was based on English ships, was the victim of the excessive underwater warfare of the German Empire and its allies. The number of sailed yachts increased sharply, in particular because of their slowness and their impossibility to maneuver effectively. Steam cargoes alone also paid their share. In 1917, the admiralty to the losses decided to launch a plan of massive construction of standardized cargo ships. These standards became those of the post-war period and the majority of these “standard” ships (type A to J) still constituted nearly half of the cargo ships in 1939. Handysize: 10,000-35,000 tonnes Handymax: 35,000-50,000 tonnes Panamax: 50,000-80,000 tonnes Capesize / over Panamax, 80,000-300,000 tonnes. Most large bulk carriers have 5 to 9 holds and are equipped with cranes between each hold, this for the poorly equipped ports. Some are called “self-unloaders” and have a system of side loading strips (the “grasshopper”). Others are gearless, with no unloading equipment and depend on well equipped ports. These are the most economical. There are also so-called “OBO” (Ore Bulk carriers), relatively complex transport, BIBO who are responsible for packing the bulk during the crossing, and finally specific types of bulk carriers like those of the American Great Lakes and the “barges”. bulk carriers “fresh water. 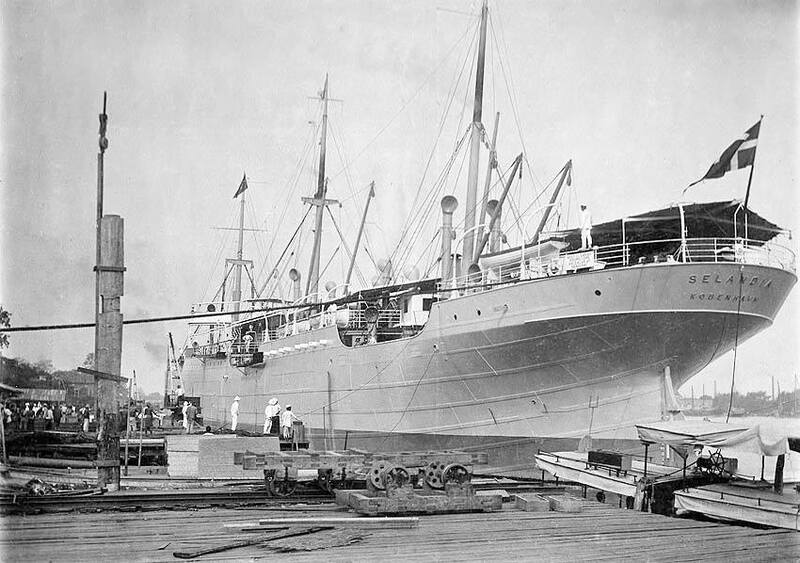 MS Selandia, the first diesel freighter. Civilian vessels are rarely seen on naval encyclopedia, except when they innovated ways of building or propelling ships. The Danish MS Selandia was one of these. Completed in 1911 by Burmeister & Wain, this 6800 TW vessel was fitted with two 8 cylinder diesel, propelling two shafts, rated for twice 1 250 ch and capable of 12 knots. Not only it allowed to get rid of large and sometimes dangerous boilers but also the venerable triple and quadruple expansion steam engines arrived at the end of their development, and the bulky provisions of coal carried, which reduced the amount of payload carried. Just like the turbine did for torpedo boats and soon larger naval ships, the diesel made its way not only in the civilian market but also in the Navy, for patrol boats and needless to say, for submarines, allowing them to cruise large distances. Submarine warfare would have been impossible without it. This strange funnel-less ship soon earned world fame, being visited by many heads of states, like an enthusiastic Churchill before the war. She also served as a mixed passenger ship until 1942, capsizing off Omaekazi, Japan. Do note that in 1903, two ships became the first propelled with diesel-electric propulsion, the Russian Vandal and French Petit-Pierre. This bulk carrier is the first true one to have been built from the keel up. A true Precursor, she was innovative on many points. Built entirely of steel, her rigidity seemed to ensure a long life. She worked on steam first (although having masts she can be rigged in schooner), which ensured a good regularity of service. With additional ballast loaded with seawater, this made handling operation quick and safe, and stability was greatly improved at sea. It is on this last point that this “steam collar”, a term used for “cargo” (there were no other sub-distinctions), built and chartered by the General Iron Screw Company Company, proved to save time and considerable money and her career was long and very profitable for the owner. Very quickly imitated, she became a standard. The John Bowes completed her career in November 1933 under the Spanish flag, she sank in a storm. At that time the bulk carriers were all of a derivative model. Dimensions: 30.8 meters PP by 5.28 meters by 3.20 meters of draft. propulsion: 2 steam engines of 2.35 hp for a single propeller, 9 knots. He received new machines in 1864 and 1883. Cargo: A load of 650 tons of coal, with a speed of delivery equivalent to two charcoal sailing classic of the time. Shipping during the early part of the Century and the Industrial Era did not changed much if not the the apparition of reliable steam engines and therefore, more constant trade with previsible schedules. Freighters during both world wars operated types of dry cargo: Bulk cargo and break bulk cargo (like grain or coal) unpackaged in hull’s compartments a bit like on tankers, later using ballasts to avoid problems of stability in heavy weather. Break-bulk cargo was basically packages or various packed goods, carried in nets and loaded during long man hours in a pecise scheme. These were loaded, lashed, unlashed and unloaded from the ship one piece at a time by dockers. This process took time and could lead to accident, sometimes fatal ones. Mishandling cargo or bad storage has also consequences. Also freighters only carried these goods inside the ship in large bays closed by bilge boards. Mc Lean had the idea of grouping cargo into standard containers. He devised metallic boxes capable of housing 1,000 to 3,000 cubic feet (28 to 85 m3) of cargo instead of nets. The larger boxes could house up to 64,000 pounds (29,000 kg) and their shape made it more secure and faster to load cargo inside a large hold. One of these benefits was that allowed the cargo to stay firmly in place when secired due to the box shape and standard in case of heavy weather (excessive roll) and also made handling operations much faster. It reducing shipping time by 84% and costs by 35%. Nowadays this way of carrying goods represents 90% of the world trade. An estimated 125 million TEU or 1.19 billion metric tons worth of cargo ten years ago. These containers, which generally are loaded top to bottom of plastified loads of corrugated boxes are usually of two types of the same size, defined by the internationally accepted ISO norm: The 20 feets (6.06m) and 40ft (12.2m). Both are 8ft (2.43m) wide, 8.5ft (2.59m) high with locked doors using the same system, although with time refrigerated types or higher boxes made their apparition like the 9.5ft (2.89m) model. The beauty of the concept is that they also fit railways platforms or the standard European 30 ton truck fit to carry the 40ft/”13,6m”(& 45ft) payload hold. These boxes are nowadays so ubiquitous and their human-compatible dimensions made them ad hoc habitats, and many end their life on land, either as private storage boxes (a car can fit inside), server housing, or student flats. But there are many projects to recycle and refurbish them as studios and flats. This could even be the return of the 1970′ concept of ‘modular housing’ that was tried in Tokyo and other places. 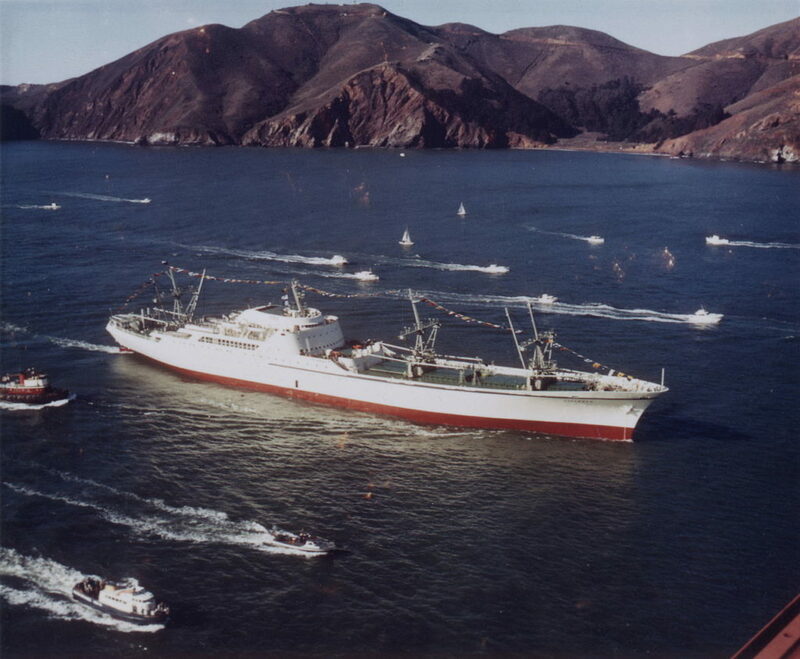 The NS Savannah, first nuclear-propelled cargo ship. She was planned by Government agencies after Eisenhower’s “Atoms for Peace” initiative, approved by the Congress in 1955 and developed by a special joint venture between the Atomic Energy Commission, the Maritime Administration (MARAD), and the Department of Commerce, built in the state of New Jersey. Her overall cost was $46,900,000 ($18,600,000 for the ship alone and $28,300,000 for the nuclear plant and fuel) – whereas the average liberty ship cost was $2,000,000, but the goal was to demonstrate the ability to travel dozens of times without refueling, which could be seen as an advantage but first and foremost the ship was an ambassador of peaceful applications of the atomic energy. At first, there were talks about just taking the USS Nautilus powerplant, but a conscious choice was made to create a reactor to commercial specification breaking all tie with the military. NS Savannah was launched in 1959 at Yard 529, completed in December 1961, acquired for commercial service in May 1, 1962 and she made her maiden voyage on August 20, 1962. She displaced 13.999 GRT or 9.900 long tons DWT, for 596 feets long (181.66 m) and 78 ft wide (23.77 m). The Babcock & Wilcox (a well-known boiler manufacturer) nuclear powerplant rated for 74 Megawatt powered two De Laval steam turbines and the whole powerplant was rated for 20.300 hp, connected to a single propeller shaft. Top speed achieved on trials was 24 knots, reduced to 21 in service (39 kph or 28 mph). Her range was 300,000 nmi or 560,000 km with her 32 fuel elements. She was conceived as a mixed passenger/cargo ship, which was obvious on her profile, as she can carry in nice accommodations 60 passengers and 10,040 tons of cargo fo a crew of 124 (yes, this was way before automatization, and there was service personnel for the passengers). But her service was short. She started with a passenger-first cruise ships for the States Marine Line with reduced cargo and was later converted as a cargo ship alone for the American Export-Isbrandtsen Lines from 1965. She resumed service until the end of 1971, when she was deactivated. Three other nuclear-propelled civilian ships were built (German NS Oto Hanh, Japanese Mutsu, Soviet Sevmorput but the real first nuclear-propelled civilian ship was the Soviet icebreaker Lenin back in 1957. The NS Savannah (also the name of the first steam-propelled American passenger ship) is now at anchor at Patriots Point Naval and Maritime Museum near Mount Pleasant, South Carolina as a museum ship and classed as a National Historic Landmark. More recently, she has been moved to Maryland to undergo a full nuclear decommissioning process, in order to be turned over to a museum group for preservation and display. This bulk carrier is a monster. With its appearance of supertanker, it seems promised to transport heavy, and it was actually built in South Korea (Hyundai) for the purpose of transporting iron ore. Launched in 1986 on behalf of the Norwegian shipowner Bergesen Worldwide Gas ASA, it could only touch two ports: Europoort, Rotterdam in Holland and the Terminal Marítimo de Ponta da Madeira of Itaqui, Brazil. It currently holds the record for a mineral carrier, and that for a bulk carrier. The only bigger “cargo ship” is currently the Emma Maersk container ship. Yet, like his ancestor of 1850, this giant has its full length for the payload, its castle and the crew, the propulsion being at the extreme rear, and being provided by a single propeller of 9 meters in diameter. Like the John Bowes, its empty return crossings are made on ballasts filled with seawater. The desalinization of the latter as the cleaning of the holds is part of its everyday life at anchor. propulsion: 1 Hyundai diesel of 27610 hp for a single propeller, 13.5 knots. Cargo: A load of 364,768 tons of iron ore.